Ahoy from the crew of the BlueJacket! We've been back at home in Marlborough, MA for about a week and are trying to re-sync with "normal life", but I'm not sure who defined "normal". In some ways it's nice to be back, but as Sue says "Life onboard the boat is much easier" and I completely agree. You don't worry about what you wear, what car you drive, most people are very friendly and if you don't like your neighbors or your view, you pick up the anchor and move elsewhere. Yeah, weather can make things complicated, but most of the time you've got amazing views. We've been so busy for the past few weeks that I haven't had time to write a log describing our last few weeks in Mexico. When I last wrote we had just spent some time at Isla Monserrate and we were beginning our long trip to La Paz. As I mentioned in another log, we originally had planned on storing BlueJacket on the hard in Mazatlan, but after looking at a variety of issues, we decided to leave it in La Paz. One of the biggest issues was that Mazatlan was more exposed if a hurricane were to directly hit. Additionally, there were about 6 flights a week from Mazatlan, but 6+ a day from Cabo San Jose and they could get us home/back without an overnight layover and saved about $200/ticket. On top of that, La Paz has a bunch of good boat stores which potentially makes repairing the boat a lot easier and it's got a lot of great stores to provision. On the way to La Paz we stopped at some of our favorite locations and tried to anchor in new places. Our first stop was in Aqua Verde (above photo) but due to the SE winds/swell we anchored in the southerly cove instead of our "normal" anchorage the the north. It was a very nice anchorage and the snorkeling was quite nice around little island to the NW. From there we thought that we were going to anchor N of Punta San Telmo, but after dropping the hook there and realizing that too much swell was coming around the point, we picked up the anchor and headed to Isla San Jose. We thought that we were going to be tricky and anchor in a location not normally used. However, after getting the anchor to stick, we decided that due to the strong reversing currents and the fact that we were probably anchored in rock, we moved again. Ah, Sue loves re-anchoring! :-) We finally dropped the hook for good just as the sun was setting at the south anchorage of Punta Mangle Solo. This provided great protection from the SE winds, but just past sunrise, strong SW winds started and we were being driven towards the rocky beach by 2'+ waves, so we got our selves out of there and headed to San Evaristo. Due to the southerly winds we anchored on the N side San Evaristo, which was also new to us. 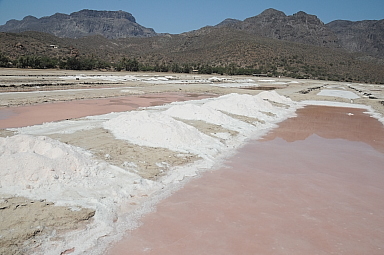 We went ashore to explore and found a large salt pond operation. Basically they flood large ditches with salt water, wait for the water to evaporate and then scrape the dried pink salt into piles which are probably sold in boutique food stores in the US for big dollars. We also hiked across the hills to the main bay, where we've anchored before, and which is where all of the fishermen anchor their boats. I must admit that we were quite grossed out at all of the fish carcasses lining the beach. I guess that the locals don't care, but man, what a way to keep the cruisers out too! 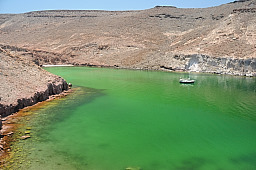 From San Evaristo we headed to Isla Partida, which is just N of La Paz. 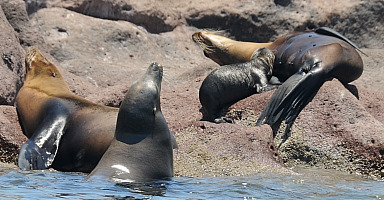 Our first stop was a narrow slot named Ensenada el Embulo (the Funnel) where we anchored the boat for lunch and then we ran out to Isla Lotes to snorkel with the Sea Lions. Unfortunately, as you can see by the photo on the right, the water was incredibly green, which is caused by the blooming of some microscopic marine life and which destroys the visibility. This is very prevalent during the spring and disappears by August/September. As a result we didn't snorkel, but instead shut off the motor on the dinghy and just drifted closely by the hundreds of Sea Lions lining the rocks. There were lots of very young pups and even some new borns suckling on their mothers. The big bulls weren't overly happy that we were there, but they weren't overly aggressive either. 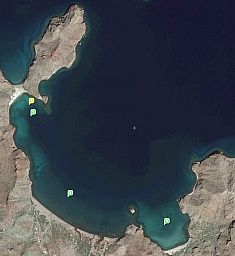 After doing that twice we headed back to the boat and moved to Caleta Partida, which is an anchorage which separates Isla Partida from Isla Espiritu Santo and we hoped for a night without strong westerly Corumel winds. We were granted that, but instead we had a bunch of big yachts anchored nearby with loud guests, music, generators and bright lights. Not exactly the way that I wanted to spend our last night out at anchor. After that we started looking for a place to store the boat in La Paz. We started checking the boat yards near down town and found that they were all run by the Aboroa family. These are OK to nice yards, but when we did a Google search on "Aboroa La Paz" we found that many of them have connections to organizations within Mexico that I don't want to be associated with and some of their names are on US lists baring them from entering the US. Oh yeah, just who I want to be writing a check to! No thanks!!! We then checked out Talleres Navales Bercovich, which I had initially dismissed because the boats are stored on sand. Then I found out that it's a few inches of sand over bedrock, and I felt better. They also have never lost a boat in a hurricane. We eventually decided to store BlueJacket there after visiting the yard and finding great security in the form of several large dogs who didn't like people that they didn't know. After a long week of getting the boat ready to haul, we arrived at the boat yard, was hauled out on a trailer and slotted into our space. 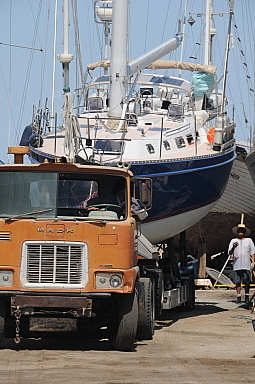 Then we started 4 days of hot work in a dirty boat yard in 90+ degree temps. I was glad when that was done! Last Friday at 6 AM we took a 3 hour shuttle from La Paz to the airport in Cabo San Jose, hopped on a 12 PM flight to DFW, just made our 5 PM flight to Boston, landed in Boston at 10:15, but didn't walk into the house until almost 1 AM. That was a long day, but it all went well. Since then we've been getting back to land based life: cars, phones, TV, mail, non-stop running water, etc. The house is in great shape and the gardens are looking pretty. It's very convenient, but I miss our life aboard BlueJacket. So that's all for this year. I hope that enjoyed the logs from year 2 in the Sea of Cortez. We certainly enjoyed our time there. Next year we've got a 1700 mile trek. We'll cross over to the mainland, work our way down to El Salvador. Where we'll leave the boat is open to discussion, but it will be somewhere in that area. We hope to see our friends before too long. And no more "We don't know if you're home" excuses. We're home, so give us a call! In Agua Verde we anchored in 16' over sand at N25-30.877'N W111-03.726. Note that we had other cruisers tell us that they had a hard time getting their anchor to stick there. At Mangle Solo on Isla San Jose we anchored in 18' over sand at N25-01.2 W110-41.342. Good holding. At Ensenada el Embulo we anchored in 20' at N24-34.870 W110-23.994. Good day anchorage or night anchorage if no strong winds predicted.